Kootenai Electric Cooperative, Inc. (KEC) is a member-owned electric utility in Hayden, Idaho. The Cooperative provides competitively priced, quality energy services to its members and is governed by an independent seven-member elected Board of Directors. Kootenai Electric has more than 23,000 member accounts and more than 2,000 miles of electric line in parts of Kootenai, Benewah, Bonner and Spokane counties. Kootenai Electric employs 80 people and is the largest electric cooperative in Idaho. KEC purchases all the electricity it sells from the Bonneville Power Administration. Kootenai Electric is a private, nonprofit electric utility owned by the members it serves. We sell power at cost. In the early 1930s, prior to the establishment of electric cooperatives like KEC, nearly 90 percent of rural America was without electricity. While more populated areas had power, it was not cost effective for investor-owned electric utilities to bring power out to the rural areas. In 1936, Congress acted by creating the Rural Electric Administration. The agency offered the loans to rural citizens wishing to form locally-owned electric cooperatives. On May 19, 1939 KEC began supplying power to 385 members. Since then KEC has been steadily growing and provides power to our member-owners the Cooperative Way. Cooperatives around the world operate according to a core set of principles that originated in 1844 from the first modern cooperative, the Rochdale Society of Equitable Pioneers in Rochdale, England. These principles, along with the co-op purpose of improving quality of life for their members, make electric co-ops different from other electric utilities. 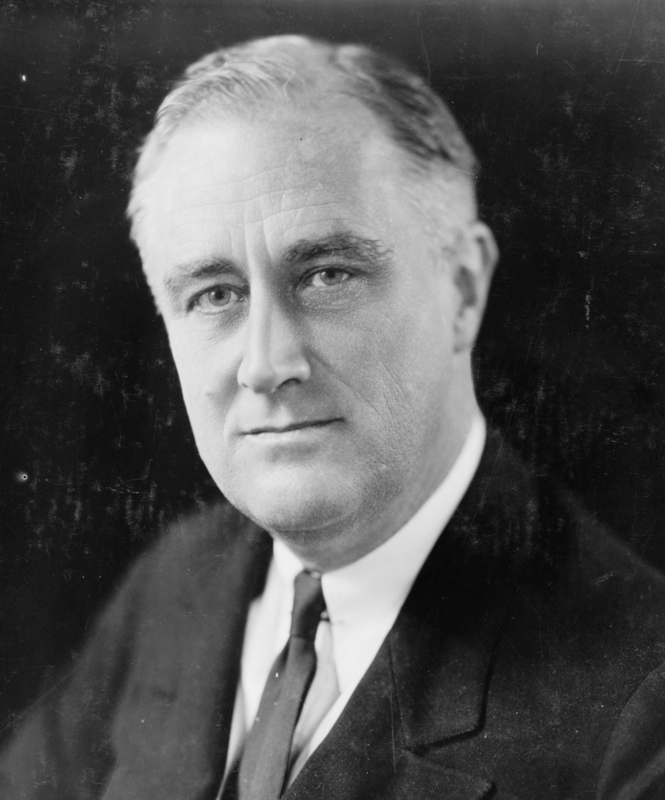 President Franklin D. Roosevelt established the Rural Electrification Administration (REA) on May 11, 1935. 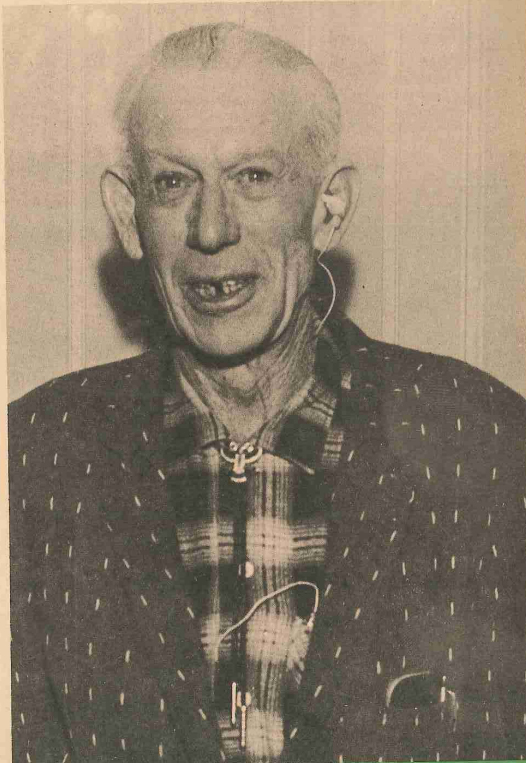 He became interested in rural electrification when his health sent him to a cabin in Warm Springs, Georgia, and he had the experience of being without power. Jesse Vetter is widely recognized as the organizer of Kootenai REA. 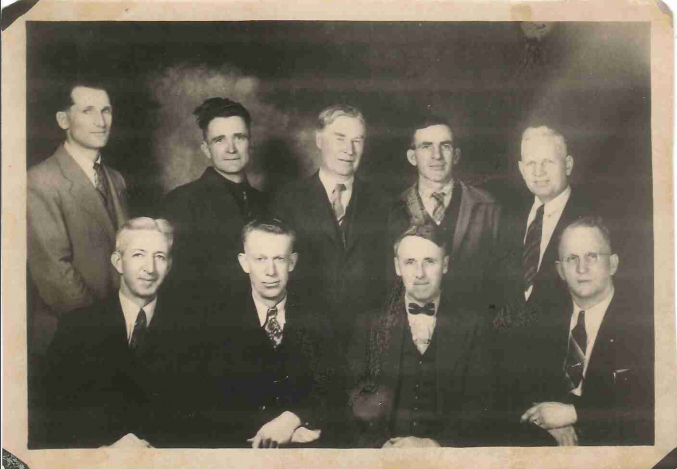 Vetter was a longtime farmer and a rural resident wishing to add the benefits of electricity to his life and so became involved in forming the Cooperative in 1937. Esther Johnson, Kootenai REA’s first office employee, was hired as a secretary-bookkeeper on September 16, 1938. With a $214,000 loan from the REA the first pole was set at Washington Water Power’s 15th Street Substation on December 13, 1938. The first line went from the substation to a division point where it broke north and south to Bayview and Conkling Park, totaling 185 miles of line serving 385 members. On May 19, 1939, shortly after 9 a.m. the first line was energized. •	In 1939, there were 385 meters on Kootenai REA’s system. •	In 1939, Kootenai REA had six employees. •	Thirty-five Board of Directors meetings were held prior to energizing the first line. •	The Kootenai REA membership fee was $5. 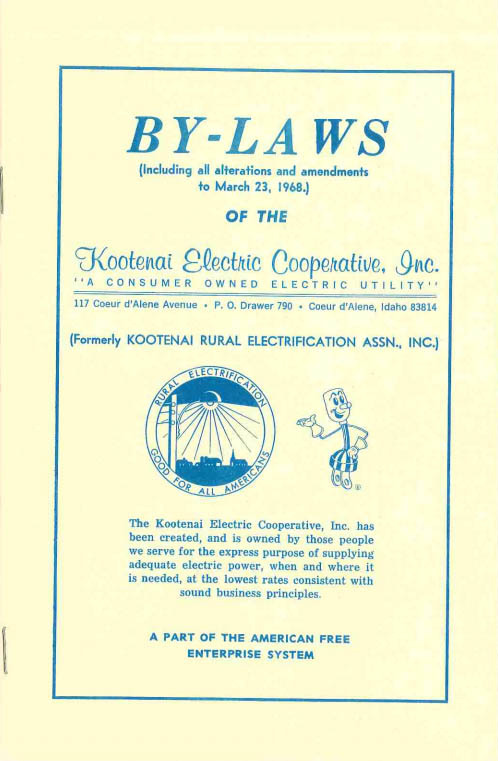 •	In 1939, a Kootenai REA member could buy 300 kWh for $11.55. •	Kootenai REA’s first office was located in a 12-foot by 12-foot room of Knudson’s Feed Store located at 201 Second Street in Coeur d’Alene. The first member newsletter debuted in 1942. The first issues were titled, “REA You Name It.” Kootenai REA member Elmer Griffith submitted the name Flashes. 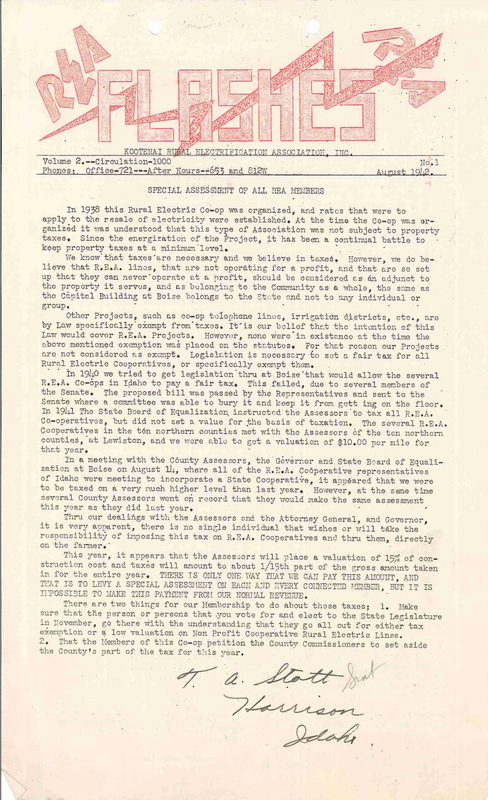 The newsletter was mailed to all Kootenai REA members and remained in circulation until 1954 when it was replaced by Ruralite magazine. Featured in the newsletter was “Dog House,” a column that listed those members by name who had not returned their meter cards. 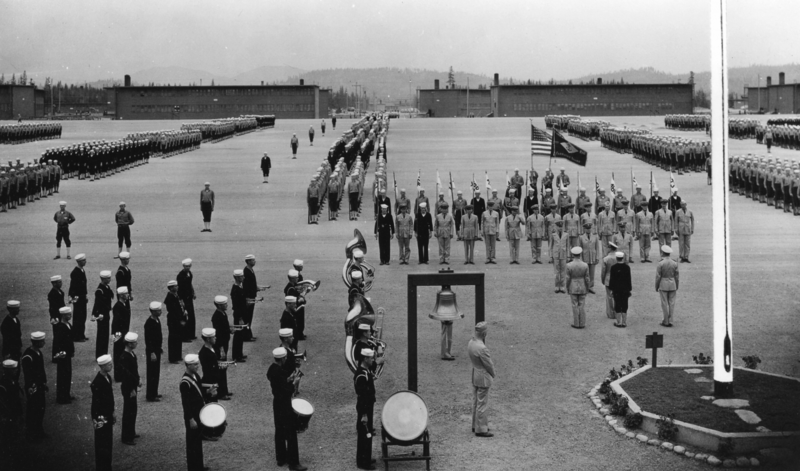 On April 25, 1942, Kootenai REA was asked to provide 300 kWh of power to Butler Construction in order to build the new Navy training center in Bayview. The REA’s efforts were strong and it only took 10.5 days to build eight miles of new three-phase line and rebuild 17 miles of line in order to provide that 300 kWh. Kootenai REA’s first office consisted of a small kitchen table and a couple of chairs located in a feed store owned by a board member. 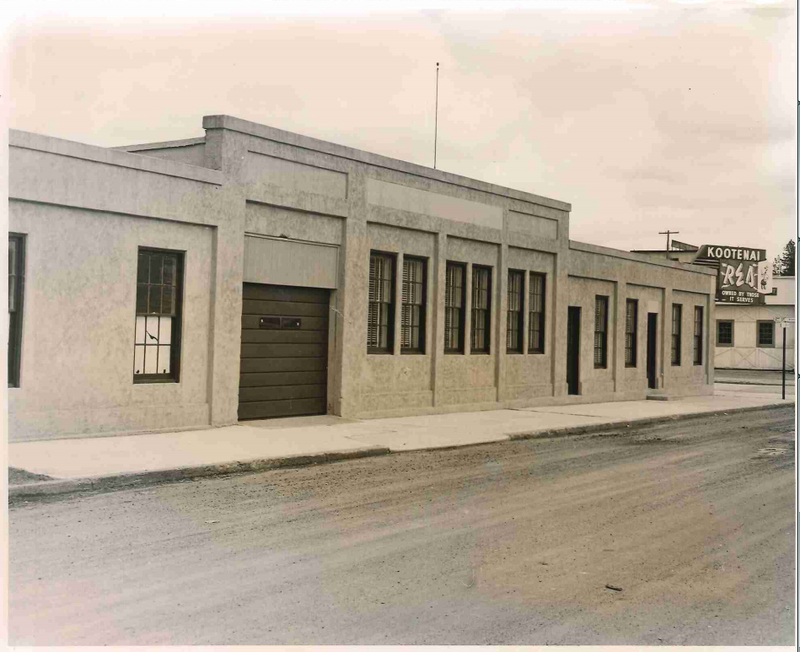 In 1945, Kootenai REA purchased its first office building from the State for $14,000 and moved a few blocks to its new location. •	In 1940, there were 545 meters on Kootenai REA’s system. •	In 1940, a 35-foot red cedar power pole cost $6.80. 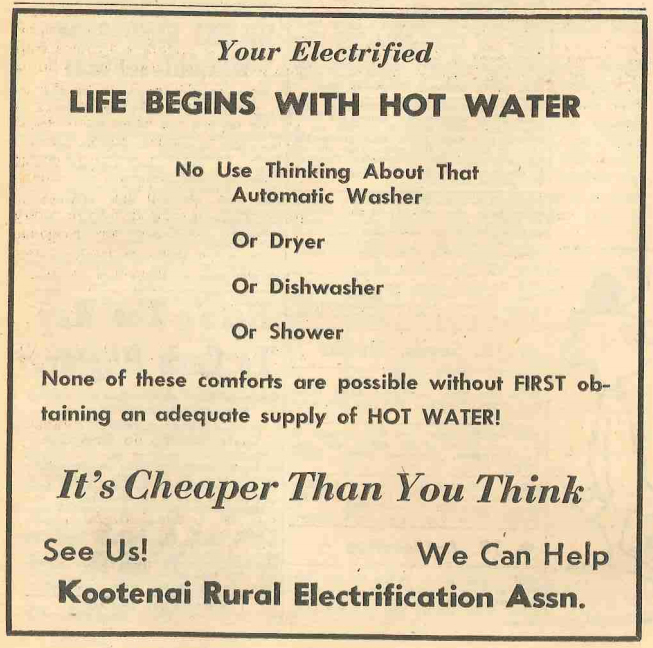 •	In 1941, a Kootenai REA member could buy 300 kWh for $10.96 after the first rate decrease. •	In 1948, Kootenai REA had nine employees. 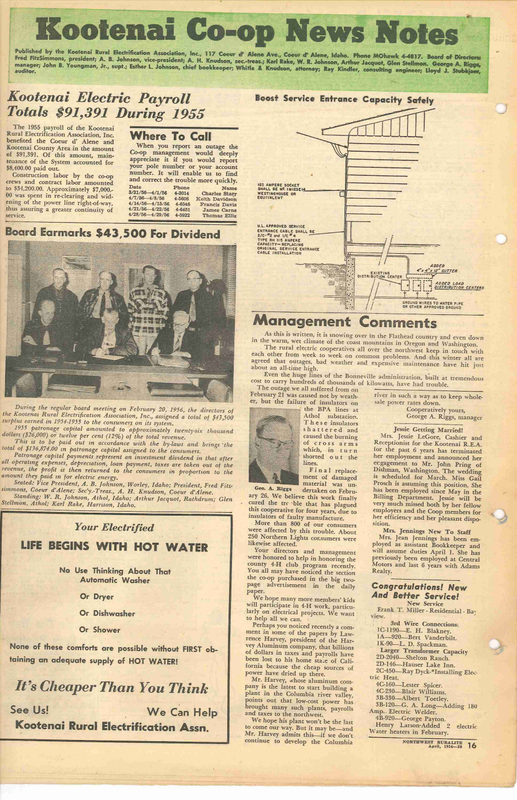 In 1954, Kootenai REA began using Ruralite magazine to communicate with its members. This monthly magazine included recipes, classified ads, home living tips and northwest feature stories. Each issue also dedicated a few pages to Kootenai REA for local news. 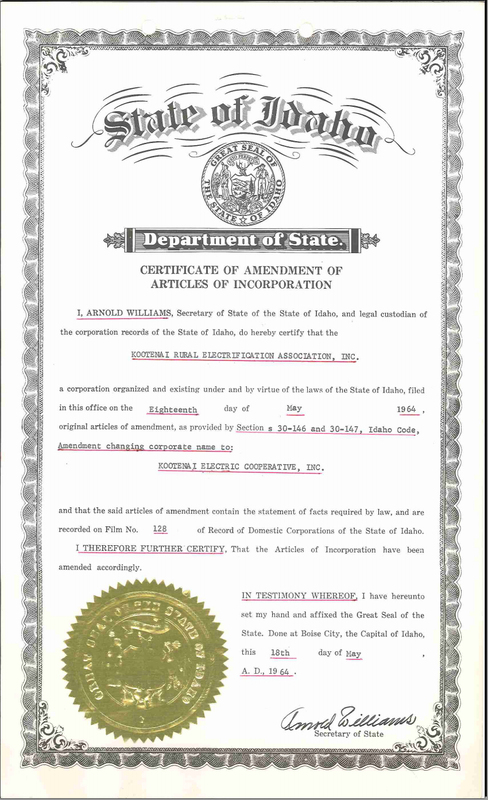 Kootenai REA continued to use Ruralite until 1995. 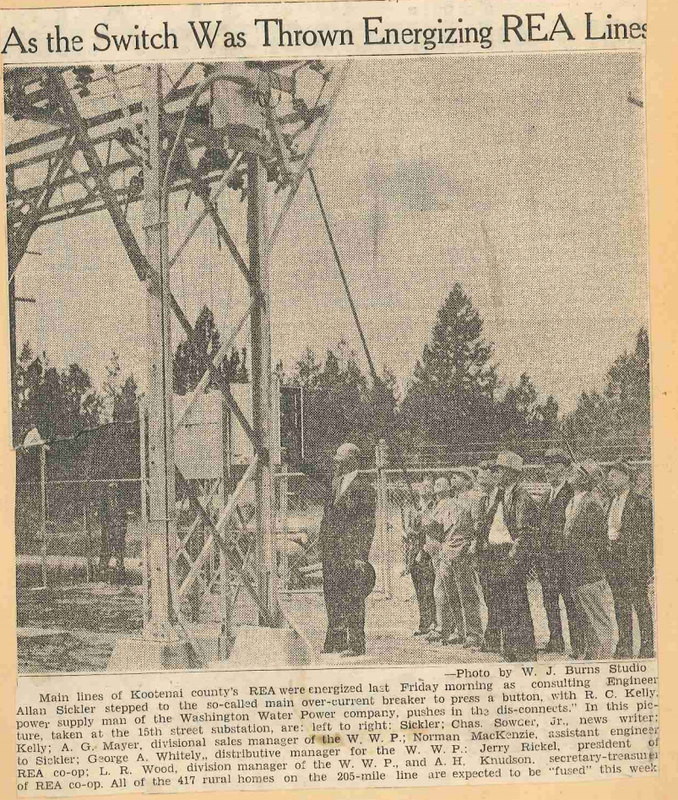 Kootenai REA started an annual loan program for the purchase and installation of all types of major electrical equipment in the spring of 1956. The first loan was made to Clarence Snyder of Bayview on May 15, 1956, in the amount of $400 to finance the purchase and installation of an electric washer and dryer. The success of the program grew and by 1966 the REA had loaned over $525,000 to its members. 546 miles of line, operative out of four substations (Appleway, Athol, Plummer and O’Gara) serving 2,520 active accounts in 11 categories. •	In 1950, there were 1,385 meters on Kootenai REA’s system. •	In 1959, Kootenai REA had 15 employees. •	Employees traveled 100,106 miles in 1959 in six company vehicles. 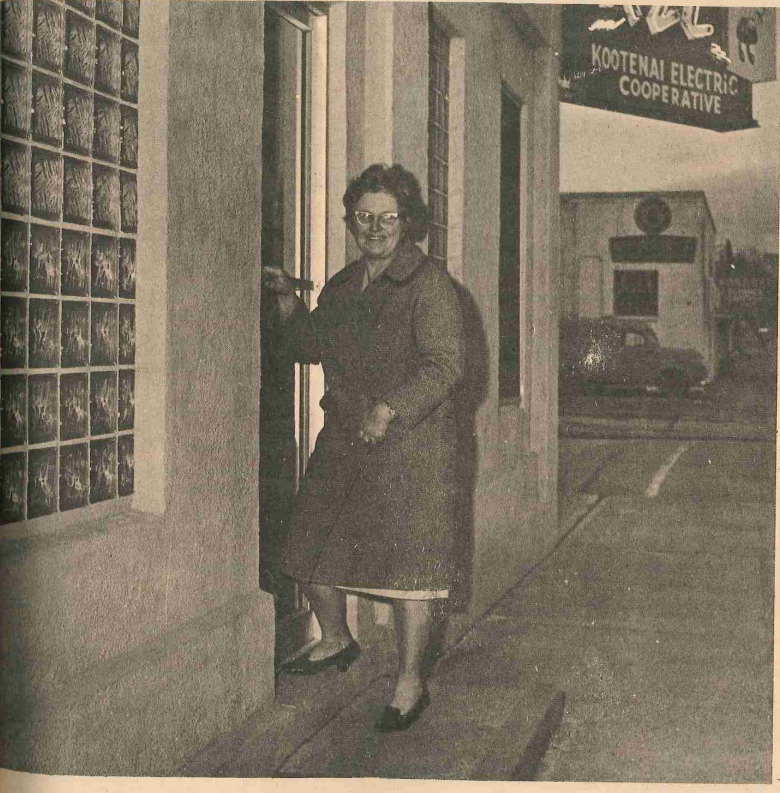 As Kootenai REA evolved, members and staff changed the name to Kootenai Electric Cooperative (KEC). 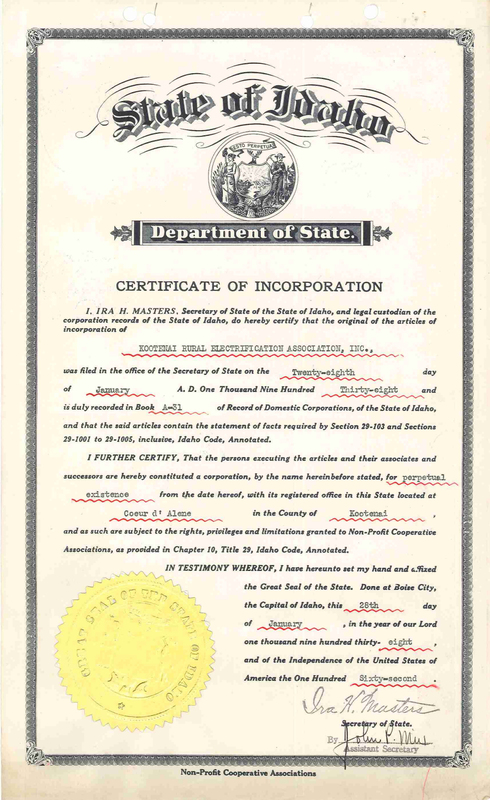 It became official on May 18, 1964, when the Certificate of Amendment of Articles of Incorporation noted the change to Kootenai Electric Cooperative, Inc. 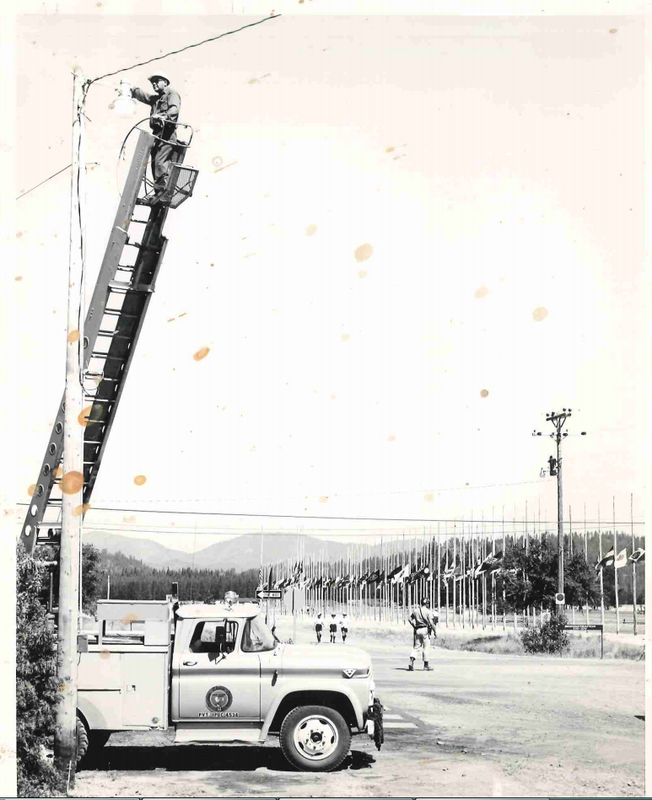 In 1967, the Northwest was busy preparing for the 12th Annual Boy Scout World Jamboree to be held at Farragut State Park, and Kootenai Electric Cooperative was no exception. 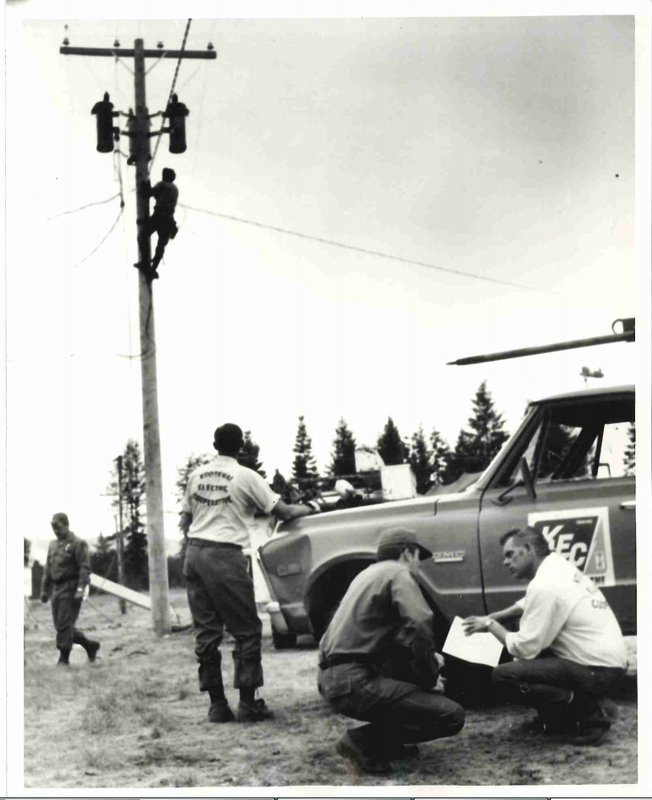 A total of 10,000 feet of underground high-voltage conductor was installed just months prior to the jamboree. Fred FitzSimmons, a charter member of the Kootenai REA Board of Directors, was selected as an honorary life director at the 1969 Annual Meeting on March 22, 1969. Fred served on the board for 31 years and saw how the area transformed with the addition of electricity. •	In 1960, there were 1,982 meters on Kootenai REA’s system. •	In 1968, KEC had 15 employees. •	From 1960 to 1969, the average monthly consumption for KEC members increased from 722 kWh to 1,167 kWh. 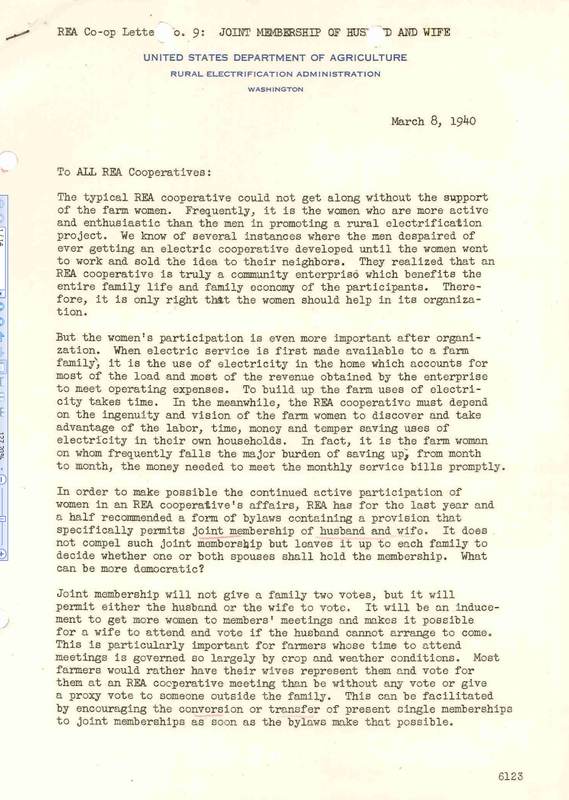 •	KEC had 3,563 members in 1969. On December 29, 1972, the U.S. Department of Agriculture announced the REA’s 2% interest loans would be replaced with 5% interest loans. The Kootenai Electric Cooperative (KEC) Board of Directors approved a right-of-way clearing program in 1972. During the program’s first year of implementation, 120.5 miles of existing right-of-way was cleared. In 1973, Farragut State Park was chosen once again to host another Boy Scout Jamboree. The eighth National Scout Jamboree-West, held August 1-7, brought in over 35,000 scouts. In preparation, Kootenai Electric made several upgrades to existing infrastructure and added additional equipment where necessary. 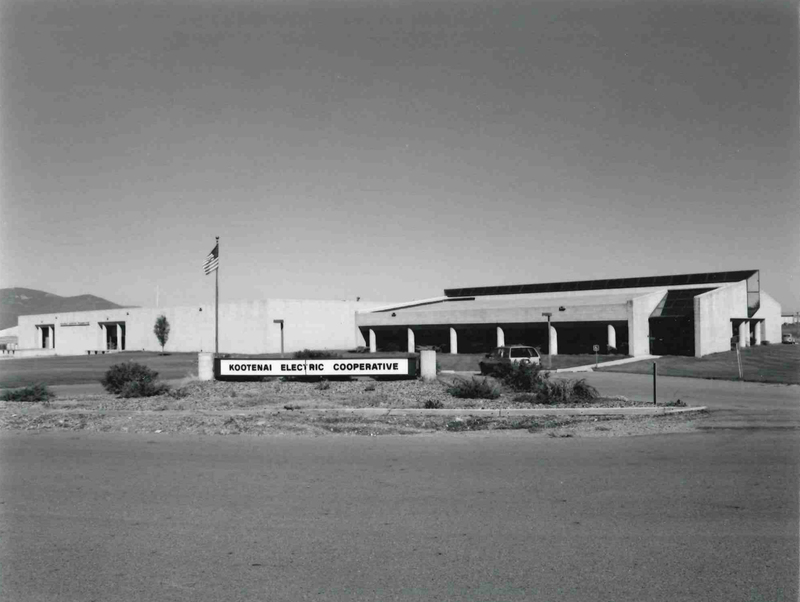 On October 15, 1979, KEC moved to a new home located at 2451 W. Dakota Avenue in Hayden. The previous location, 2nd Avenue and Lakeside, had been home for more than 30 years. The new facility allowed for all of KEC’s equipment and trucks to be in the same location as the office. It was also the first time that the trucks would be stored inside, shortening the response time for an outage. •	In 1970, there were 4,227 meters on KEC’s system. •	In 1972, KEC had 18 employees. •	74,904 feet of underground primary line and 20,836 underground secondary line were installed in 1972. •	1973 was the first year for KEC revenues to exceed $1 million. That year KEC also experienced its largest growth (at that time) of 472 new members. •	79 miles of new primary line was built in 978 (46 overhead and 33 underground). •	KEC installed 389 new transformers and replaced 75 rotten poles in 1978. 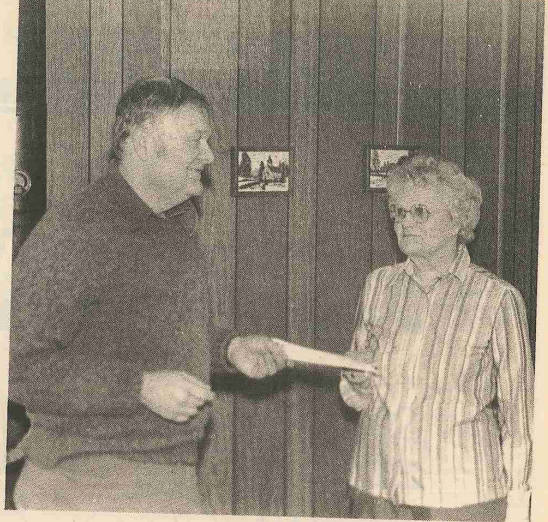 In 1982, KEC developed a Member Assistance Program allowing members to help other members with their energy bills. St. Vincent DePaul agreed to administer the program since the Cooperative could not use its revenues for this type of program. Member contributions were mailed with their payments and deposited into an account for assistance. 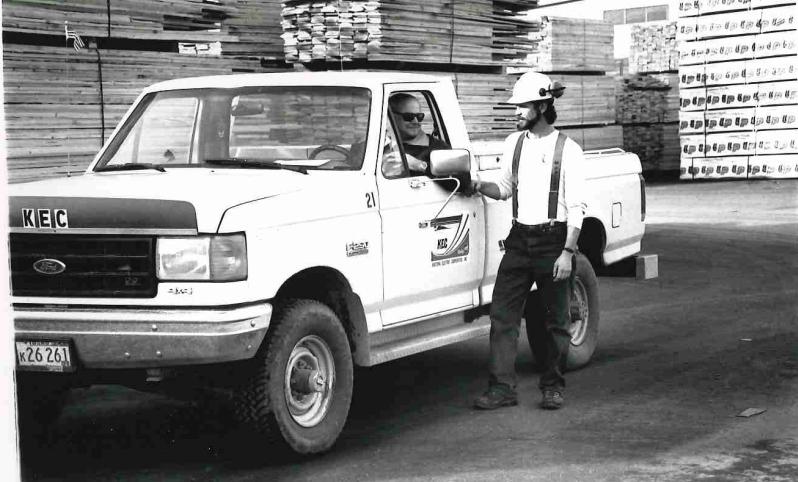 In 1984, Kootenai Electric, along with the Bonneville Power Administration (BPA), constructed the Scarcello Substation in order to serve a large lumber mill, Louisiana-Pacific. In 2003, the mill site was sold to Riley Creek Lumber, now known as Idaho Forrest Group. In December 1985, the Cooperative retired capital credits for the first time. The first members to receive the capital credits payments were the first members to supply capital, or the earliest Cooperative members. $263,000 was retired from 1938-1970 and an estimated 20,000 checks were distributed. On display at the Annual Meeting in 1987 was a mockup of the proposed development for the old Henley Aerodrome in Athol. During the presentation by Norton Aero Ltd., they described a vision that included a fully operating steam train ride, a replica of an 1880s mining town, theater, saloon and vintage workshop. Better known as Silverwood, this carefully-planned town allowed you to take a step back in time and experience the grandeur of a turn-of-the-century mining town. 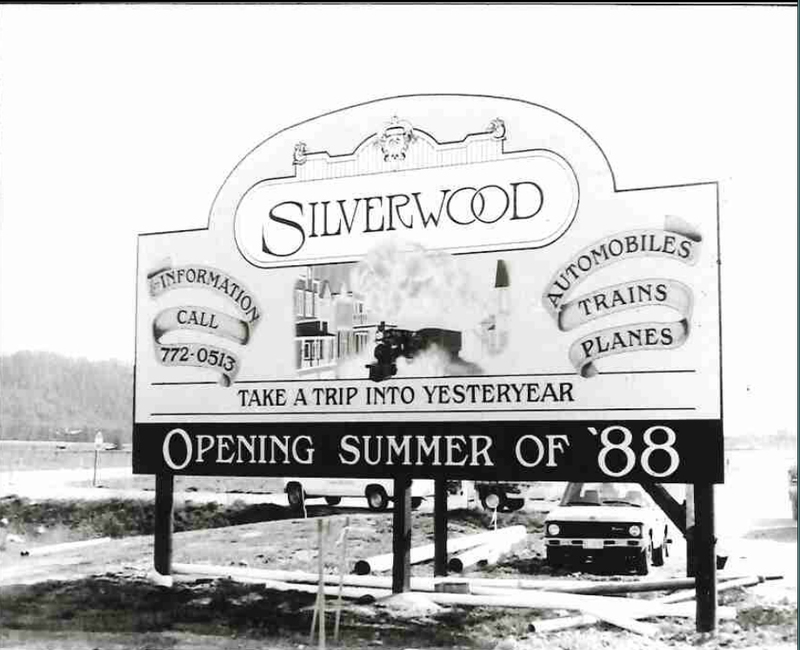 Silverwood opened in June 1988. 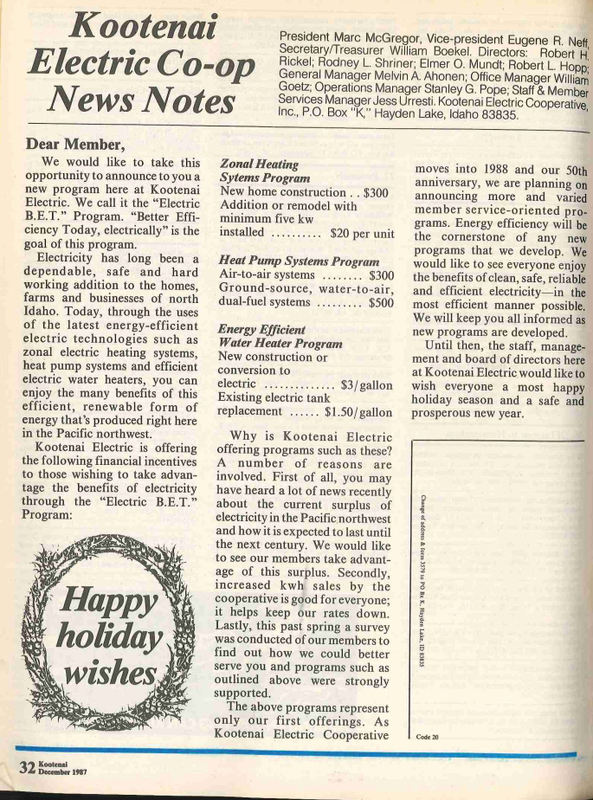 In December 1987, KEC began offering rebates with the “Better Efficiency Today” program. •	In 1980, there were 8,102 meters on KEC’s system. •	In 1985, KEC had 33 employees. •	In December 1986, 6,700 checks, returning $225,000 in capital credits, were mailed to KEC members from 1971-1973. •	KEC’s equity was over 32% by the end of 1986, up from 21% at the end of 1983. 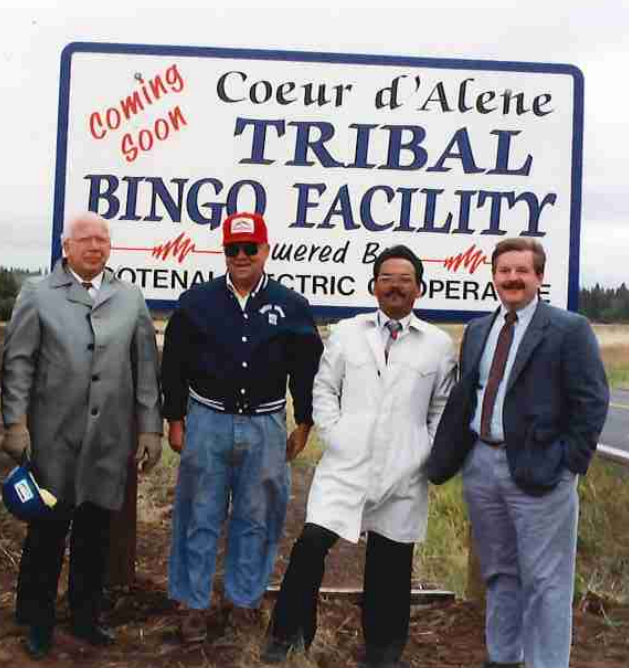 On March 27, 1993, Kootenai Electric Cooperative (KEC) held its Annual Meeting at the newly opened Coeur d’Alene Tribal Bingo Hall. Prior to this, KEC and the Coeur d’Alene Tribe met and developed what was hoped to be a long-lasting partnership. KEC provided more than $100,000 worth of infrastructure for the 26,000-square foot bingo hall. 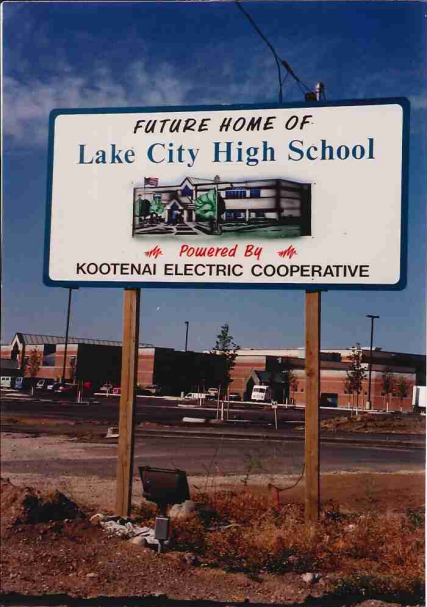 In September 1994, Coeur d’Alene’s newest high school, Lake City, set a new standard for an energy efficient geothermal project in North Idaho; in fact, there were only 50 similar projects in the United States at the time. Energy efficient upgrades to the high school landed them a $140,000 rebate from KEC and an anticipated savings of 18% on their energy consumption. In April 1995, KEC discontinued the Ruralite magazine and started PowerLines, a monthly member newsletter. 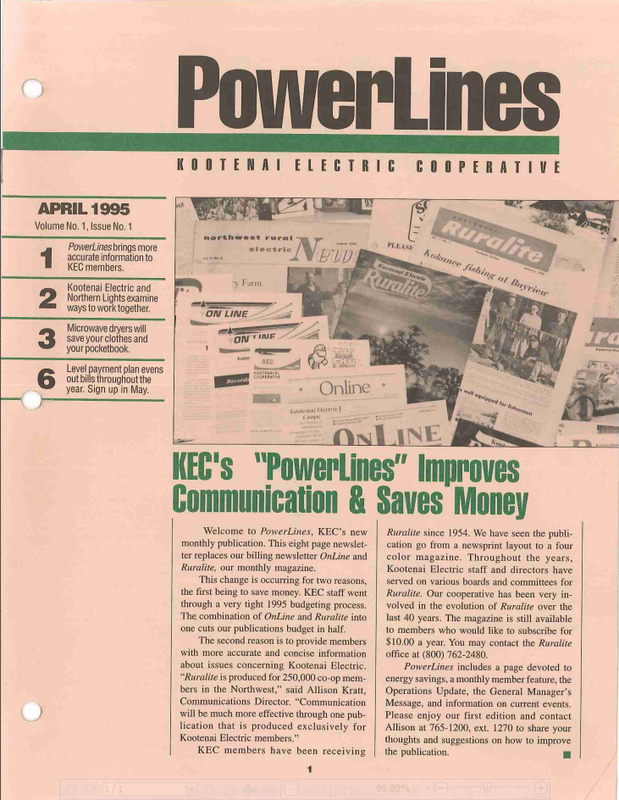 Developed by KEC, PowerLines delivers relevant Cooperative information to KEC members and is still in circulation today with more than 200 issues since its inception. 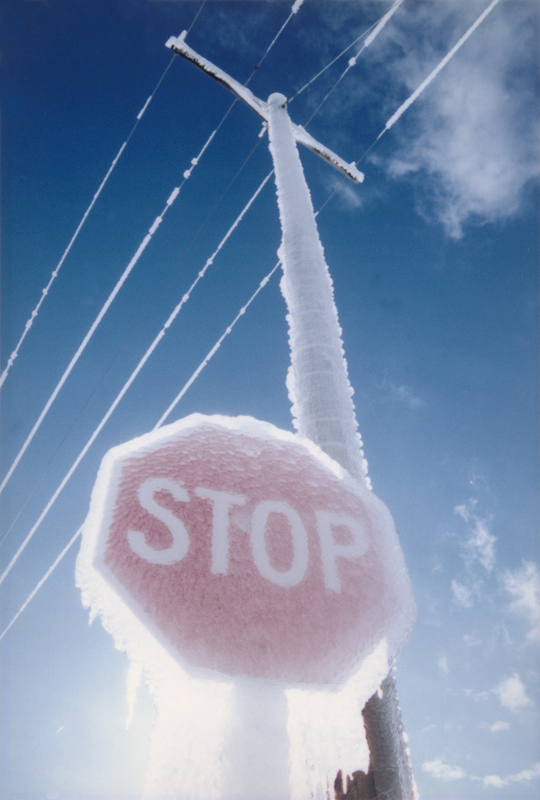 In November 1996, an ice storm hit North Idaho and nearly two-thirds of the KEC system was destroyed. Residents of Plummer, Worley and Harrison were among the first to lose power. KEC crews began working on storm-related outages at 2 a.m. on Tuesday, November 19. At the peak of the storm, about 4,000 KEC members were without power. Contract crews from several locations, including Seattle and Portland, came to assist in repairing the damage and a total of 19 crews worked around the clock to restore power. Due to the severity of the storm and the extensive damage to KEC equipment, power was not fully restored to all members for about a month. •	In 1990, there were 10,553 meters on KEC’s system. •	In 1990, KEC had 41 employees. 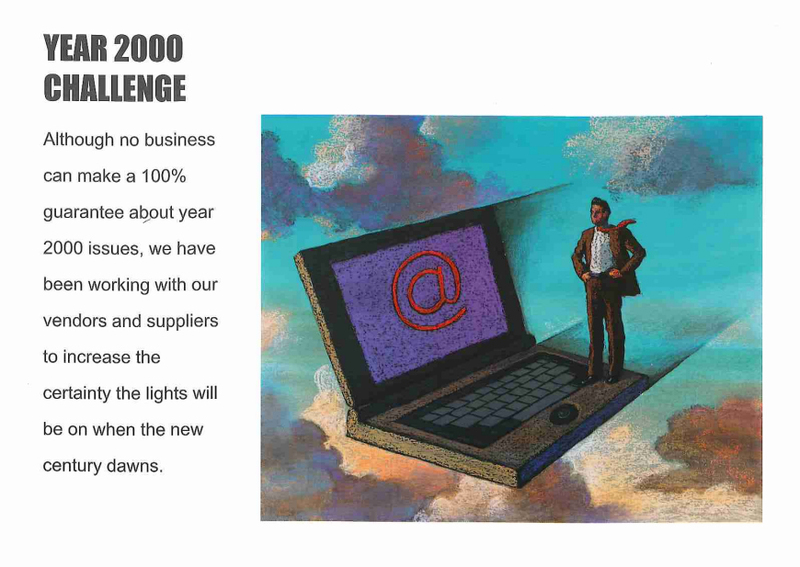 •	In 1991, it took eight employees 12 days to read approximately 9,800 meters across 1,123 miles of line. •	In 1995, KEC had 922 new service connections. •	In 1998, KEC returned $403,000 to members due to a temporary rate reduction. KEC showed its commitment to community in November 2002 by implementing the Operation Round Up® program. This program, originally created by a cooperative in South Carolina, rounds up participating members’ bills to the nearest bills to the nearest dollar and deposits the additional amount into the Kootenai Electric Trust. The funds are administered by an independent board made up of KEC members. In 2011, Operation Round Up® totally grants reached $500,000 donated to our community. After the KEC Board of Directors approved the installation of a new automated meter reading system in 2001, KEC began installing these new meters on our system in April 2003. These Two-Way Automatic Communication System (TWACS) meters made it possible for KEC to read the meters through a computer and provide members with a more current and accurate bill. In March 2007, KEC joined more than 600 cooperatives around the country and became a Touchstone Energy® Cooperative, a nationwide brand and marketing effort that identifies cooperative utilities providing superior customer service while maintaining a strong local presence. One of the many benefits of Touchstone Energy® is a membership card distributed to every KEC member. The Co-op Connections® Card also provides discounts to hundreds of businesses and services, both local and nationwide. •	In 2000, there were 16,378 meters on KEC’s system. •	In 2000, KEC had 63 employees. •	In 2001, KEC held its first annual golf classic. This charity golf tournament raises money for local non-profit organizations. From 2001-2009 the KEC golf classic brought in $87,883 and continues to raise money for the Operation Round Up® program. •	In 2007, the Operation Round Up® Trust Board began awarding ten $1,000 scholarships to KEC members or their children. •	From 2000 to 2009, KEC’s total accounts increased by nearly 40%. In an effort to evaluate the effectiveness of demand response, Kootenai Electric Cooperative (KEC) participated in a pilot program with the Bonneville Power Administration (BPA) called the Peak Project. This innovative program regulated participants’ water heaters and thermostats during times of peak demand. Installations began in homes in January 2010 and the pilot project was completed in 2012. In March 2012, KEC’s first generating resource came online at the Fighting Creek Landfill. This gas-to-energy project was developed through a partnership with Kootenai County and has the capability of producing up to 3.2 megawatts of power, or enough energy to power approximately 1,800 homes. As 2012 came to a close, KEC’s second generating resource came online at the Kootenai Technical Education Campus (KTEC) in Rathdrum. With the assistance of a USDA Rural Energy for America Program grant, this 18-panel solar array was built as an educational piece for KEC and KTEC students and allows KEC to expand their production of renewable energy. “Educating KEC members and the community on renewable energy reaffirms our commitment to community and empowers local youth,” said Don Crawford, KEC’s Energy Services Program Administrator. •	In 2010, there were 23,251 meters on KEC’s system. •	In 2010, KEC had 69 employees. •	At the 2010 Annual Meeting, members approved a bylaw change to allow vote-by-mail ballots. During its first year of implementation, over 3,700 vote-by-mail ballots were cast. 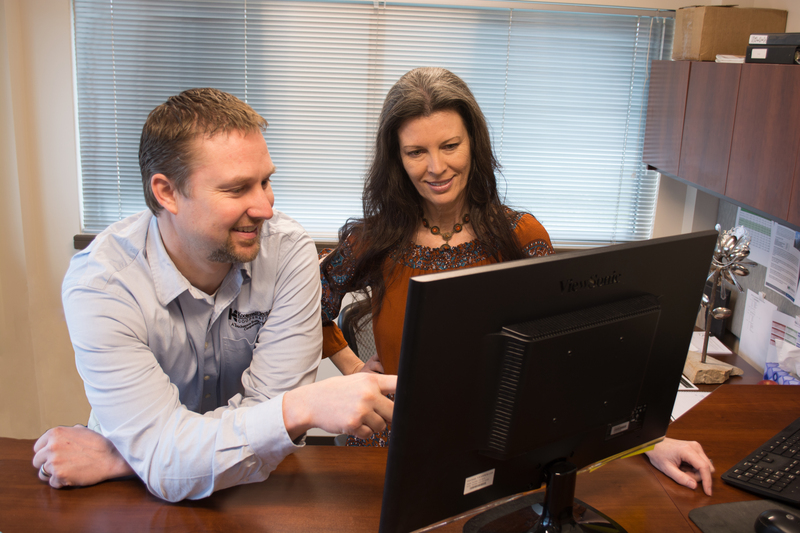 •	In January 2011, Kootenai Electric replaced its customer information system, which had been in place for over a decade. The new system allowed KEC to offer hourly electric use data available for members to view online.